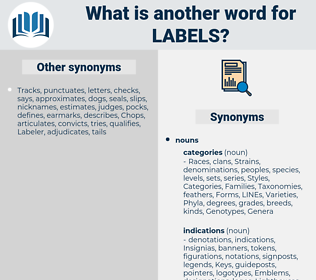 What is another word for labels? emballages, Trademarks, Marques, shapes, marks. Companies, corporate, describes, codebook, ingredients, calls, Firms, Societies. albums, names, recordings, Certifications, instructions, characteristics, credentials, certificates, considerations, publishers, landmarks, Periodicals, producers, inspectorates, registrations, brothels, Households, Records, tables, benchmarks, observations, seals, CDS, indicate, producteurs, charts, appliances, Magazines, dealers, descriptions, Elles, headlines, allegations, Trademarks, TAPES, products, listings, clubs, containers, terms, nametags, Marques, Identities, titles, Regulations, messages, Diplomas, heading, headings, distinctions, demolitions, Suggestions, marked, specimens, postcards, Boxes, Journals, fields, maisons, signboards, plates, thumbnails, features, DISCS, arguments, residences, clusters, Categories, trade-marks, remarks, indicators, statutes, flags, annotations, packings, shapes, numbers, marks, auspices, Vendors, Charges, vouchers, traces, Posters, expressions, centres, inspections, dwellings, tabs, rubrics, growers, scenarios, hats, ICERS, devices, logos, alarms, diskettes, symptoms, note, employees, Standards, books, holdings, designs, claims, tracers, pointers, columns, criticisms, degrees, Policies, points, cohorts, Scars, LIDS, caps, packets, reviews, Houses, revues, Securities, Gestures, titres, scores, packs, items, Marcas, regimes, homes, sections, words, offences, CAMPS, passes, topics, Ones, schemes, Entries, signs, bids, horns, Wars, coupons, Drives, shares, tokens, tenders, disks, comments, bonds, markups, Ticks, counts, figures, LINEs, makes, Companies, ingredients, Firms, Societies. 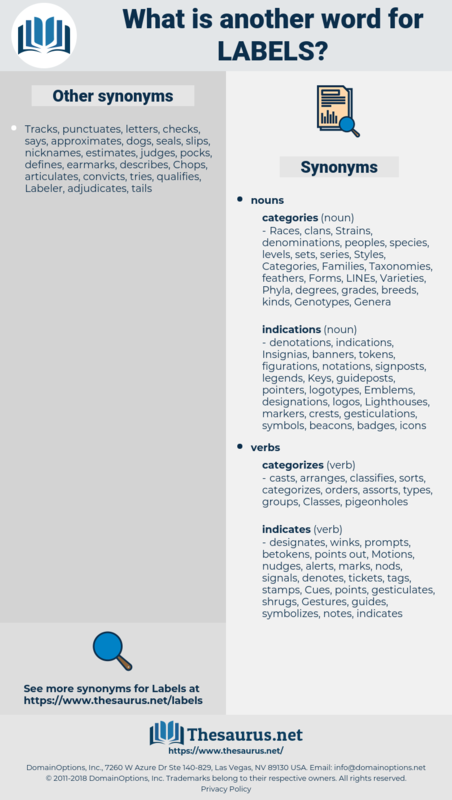 characterizes, categorizes, designate, designates, Les, denotes, signifies, determines, defines, appoints, depicts, says, means, stands, refers, ranks, calls. Labelling, describe, corporation, corporations, Labeling, tag, tags, emblem, etiquette, sticker. eco-labels, marking, distributors, appellations, bottles, denominations, designations, qualifications, banners, ballots, Packagings, Emblems, declarations, decals, indications, requirements, papers, badges, signals, hallmarks, stickers, placards, markings, packages, symbols, markers, stamps, deeds, wordings, mark, tickets, captions, vignettes, corporations. indicates, identifies, classifies, qualifies, signals, marks, describes, tags. All the cigars made in the United States are invariably put up in imitation Havana boxes, with imitation Havana labels and brands. Every important question leads him to a stone wall which he does not try to scale or penetrate, but labels the " Unknowable." loveable, lowball, liveable, labile, lovable, lobelia, level, labial, lapel, livable, low blow, lively, lappula, loophole, liable, loblolly, lovely, lawfully, low-level, libel, lovell, lobule, love apple, lawful, lapful.